Internet Explorer crashes, how do I fix it? I keep getting the message "IExplorer.exe has generated an error" when I browse the web, and Internet Explorer crashes and shuts down. Why does this happen, and what do I do to fix it? IExplore.exe which is Internet Explorer, or more commonly "IE", is perhaps one of the most used pieces of software ever written next to the Windows operating system itself. Unfortunately, being such a widely used program, when it crashes a lot of people notice. And since not all crashes that look like IE are actually caused by IE, things get very confusing, and perhaps very frustrating. Let's look at some of the clues to help identify the problem as well as some steps that may help resolve the issues we find. Continue Reading: Internet Explorer crashes, how do I fix it? Why does email disappear from my phone? I keep running into a situation where I see an email on my mobile phone, and then a little while later it's gone. Yet when I get home, it's there in my email program (Outlook). Having email disappear does me no good when I'm out and about. How do I get those emails to ‘stick' on my phone? With more and more people reading email on their smartphones, this is actually a pretty common situation, as it's very easy to misconfigure things when adding a phone to your setup and have email seemingly disappear. I'll review what I think is happening, and then explore the alternatives to fix it. Continue Reading: Why does email disappear from my phone? Is there any way we can stop Google doing this (anti-privacy) stuff? I have a PC which I normally use with Firefox, but sometimes Chrome (usually when page translation is needed). My son occasionally uses the PC but always with Chrome. Today I went to fill out a form for entry to a competition: as soon as I entered the first ‘S' of the name, Google filled out the WHOLE of the rest of the form with HIS mobile number, HIS email, in fact all his personal details. He assures me he has not activated any autofill or checked any ‘remember me' boxes and (since he's well over 30yo and totally honest) I believe him. The entry form came from a local newspaper and is nothing directly to do with Google or their services. SO the question is – how to prevent this happening by default – after all, this means that ANYONE who uses this PC has access to all my son's personal info. Surely Google can't be allowed to get away with this, and anyway, either way, the rest of your readers need to know of this gaping hole in security created by Google? Sure. I think you're blaming the wrong entity. There's a lot of confusion when a browser (yes, any browser) automatically fills in something on web page when we start typing. There's nothing deep, dark or nefarious going on here. No one's trying to violate your privacy. It's simply your browser doing its best to be helpful. Continue Reading: Why is Chrome automatically filling in forms? Ham, in the context of computing, is simply a colloquial term for email that is legitimate email – in other words not spam. Many spam filters, either internally, in documentation or occasionally in user interfaces, actually use the term as a shorthand for "legitimate email". 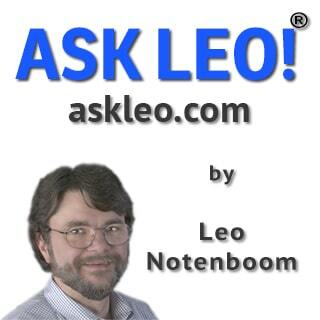 In Leo's world ham can also refer to a licensed amateur radio operator, or a savory meat. I just discovered your site and have been reading through many of your articles -- all very helpful. What do you think of Norton anti-virus software? I see that you advised against all-in-one "suites" -- which I assume includes Norton -- but that it what I have right now. Per your suggestion to use Microsoft Security Essentials, it occurred to me that maybe I just use that, but I have to disable Norton first to do so (which actually may not be that easy; my experience with Norton is that it is almost like a virus itself in that they really nag you to come back. That's why I still have it; I just couldn't take it anymore and eventually gave in!). Would you recommend I do this? "...it is almost like a virus itself in that they really nag you to come back." - I think you may have stumbled onto one reason I don't mention Norton much. It's had its ups and downs as a product over the years, but seems OK these days. If it's running and working for you I don't see a need to change. I know you want to hear the expert's opinion. I'll share mine, too. I respect and understand Leo's comment - I'll address it further below. Regarding removal, simply google "Norton Removal Tool" and be careful to download it directly from a Norton.com website. It will remove most any recent Norton program after which your PC will need to be rebooted. As Leo and most other techies recommend, do NOT run multiple real-time anti-malware programs on the same PC as they will at a minimum fight for resources and can conflict with each other to cause operational problems. Note that Comcast offers to its Internet customers for free the rebranded Norton Security Suite which is essentially the Norton 360 program. Each year since Comcast has upgraded the program at some point after the retail version has been released. They currently offer the 2014 version (as of today, 21.6.0.32). You don't have to install the Comcast ConstantGuard package. The Norton offering has been available as a standalone ever since Comcast switched from giving away McAfee. I currently await to see what Comcast offers going into 2015, as Symantec has revamped and simplified its Norton product line greatly. I did run the Norton 2015 beta on a test PC for a handful of weeks but the beta is no longer available. Comcast has announced recently that they are doing away with the ConstantGuard - I describe it as umbrella code - that really does not do anything new but hides the Norton name behind the ConstantGuard user interface. In other words, crapware. I have been a fan of Norton since the 1990s, not that I have always been happy with it in the past, but I believe it offers the best protection. The Norton Anti-Virus engine has consistently been at the top of the reputable head-to-head comparisons of anti-malware software for years. My recollection is that, in the early days of anti-virus software, IBM had a great team with a superior program. Norton bought it and rebranded it as their own. In time, the program became more complex as it adapted and grew to fight more challenging attacks and malware. At one point, it was clear to me that anti-spyware and anti-malware vendors would cross over and attempt to cover "both" of those bases with one program - so that there was only one real-time engine running in the background - and that made sense to me. While I cannot and will not attempt to speak for Leo, I can share some issues I found while working with Norton. During those years, Norton became quite buggy when it came time to move to a newer version, switch product lines, or simply reinstall or uninstall. But the protection was IMHO still first-rate, scoring higher than most other well-known programs. In 2009, the Norton product (based on Norton Anti-Virus and found in Internet Security, 360 and now just Security) was redesigned and rewritten. It was much faster to install, it added less time to bootup, the updates were less impactful on other foreground applications. I still found, though, with the Comcast branded Norton Security Suite that their version would be released in the fall of a year and that that installation version was never updated. So after installing a fresh copy of that year's version, Norton would have to be updated and often those updates were serial in nature. The worst I recall was about eight updates and six of them required rebooting. I also favored the bundled Norton when they included a backup utility when Windows Home Editions did not offer that utility. I wonder about Microsoft Security Essentials - they state that it cannot be installed now on a Windows XP PC, but it seems to still run scans and grab updated definitions, despite the doom & gloom warnings when run on XP. I recommend it as it seems to have a smaller impact while it provides real-time protection. As well, Microsoft is not trying to up-sell anyone to a fuller version. It seems that Windows Defender now encompasses MSE, but Defender can also be run standalone. Note that I have seen Defender root out a virus that even Norton missed. In other words, I do not believe that any anti-malware program can catch all problems, even if they are fully up-to-date. And some may catch problems sooner than others. But for the performance and reliability, I'm still a Norton fan. I've never been a big fan of Norton, but that's mostly because of the reputation it garnered about being nearly impossible to uninstall. That one would need to search for and download a separate tool to do so still bothers me a lot. It also suffers from feature-itis - as many of the name brand security suites have - trying to do more and more that has less and less to do with actual security. I realize it's a competitive feature race, but I would prefer a tool that does one thing and does that one thing really well. Speaking in generalities now (not specifically Norton) all those additional features and options and such, turned on by default no less, frequently serve to slow machines down, interfere with other operations, and just generally confuse the user. I just recently uninstalled a different major package from the machine of a friend because the anti-spam portion of the tool was apparently impacting the performance of her email program quite seriously. I don't want my anti-malware tool to also try to be an anti-spam tool. In my mind those are two different things, and best served by two different utilities and even two different approaches. I hope that Norton's simplified 2015 interface will reduce some of that confusion and remove some of the attempts to be a one-stop solution for everything under the sun. I'm sure that their anti-malware utility is just fine - but that's typically not what I have issues with. There are so many ways to communicate these days it just boggles the mind. What was once limited to postal mail and (land line) telephone calls has blossomed to include instant messages and chat, store-and-forward audio and video messages (you record and send; the recipient listens or views at their convenience), text messages, video call services like Skype and others, as well as group conversations using tools like Google Hangouts. Not to mention mobile apps that mimic walkie-talkies in addition to good old mobile phone calls and text messaging, and much more. I do some or all of those from time to time as situations warrant. But I keep coming back to a tried and true communication mechanism that works the best for me for so many different reasons. I keep coming back to email.